Chris Saverese delivers once again with video from over 25 years ago as Jean Jacques Machado fights in the Copa Cantao against an unknown grappler. Though edited, this clip gives great insight into the game we fight and how it has evolved. Make sure to sign up for the RCJ 5 Brothers Camp where you can train with Jean Jacques and his four brothers (also pretty darned accomplished at Brazilian Jiu Jitsu) in Texas this October. Some sick ippons for your Thursday viewing pleasure. Study and enjoy! 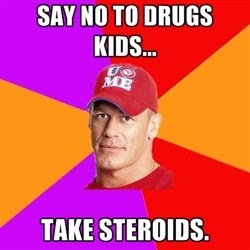 Steroids... 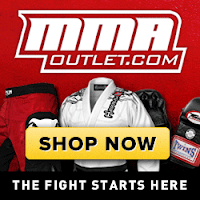 The Ultimate Leverage in BJJ and MMA? mance Enhancing Drugs (PED's) and steroids? 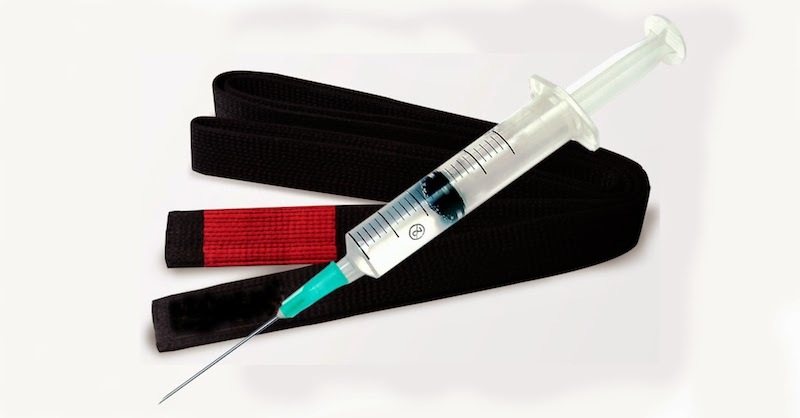 Are our fellow martial artists THAT insecure with their ability to apply the principles our forefathers imparted upon us, that they will inject poison into their bodies in hopes that they will not piss hot on a whiz quiz!?!?!? I mean at the very least you could smarten up and clean out your cycle as you KNOW you will get tested!!! Though it should be no less surprising regardless of the academy these guys come from, it stings a bit more when instructors such as Brian Ortega who is a black belt at the Gracie Headquarters under Rorion and his sons Rener, Ryron, and Ralek, test positive. I guess the Gracie monicker of "Keep it real," in all reality has absolutely no meaning whatsoever. "Keep it playful..." unless of course I might lose so therefore it is justified that I take whatever I can, and do whatever I can to WIN!!!!!!! Then there is the sad case of Robert Drysdale. One of the fastest to climb the belt ladder to black, and seemingly one of the slowest learners in MMA as he just got popped for excessive testosterone levels... for the second time. With this announcement the UFC quickly let everyone know that Drysdale is no longer in the UFC (was he ever in??). Fines and suspensions from the NAC are forthcoming. I feel bad for these guys and all the others who lack so much confidence in the technique and ability that they have spent years refining. What a waste. Not sure what the pay off is since I have never partaken of PED's or roids, but I sure hope it is well worth it. 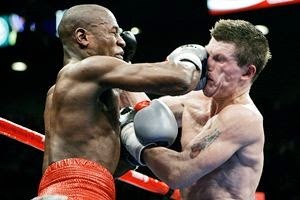 I have seen the Machado Brothers do something similar. Too cute and fun! 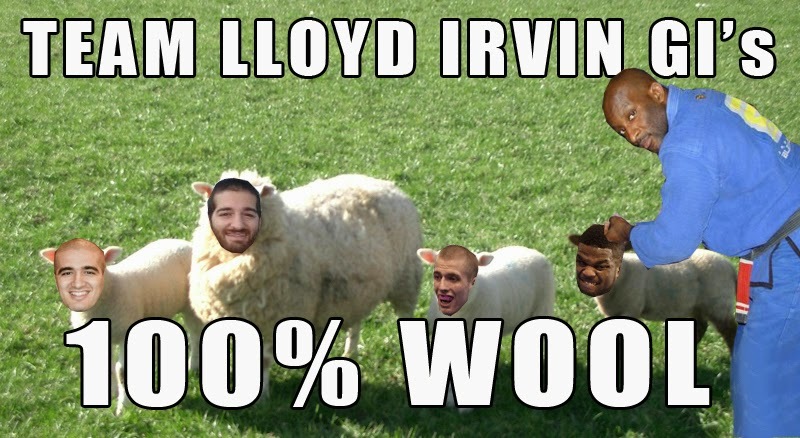 "Please consider the real problems behind the Team Lloyd Irvin facade before you get manipulated into writing a fluff piece to help Lloyd Irvin rebuild his fading money maker and cover up his reputation." My friend and teacher Tim Cartmell will be visiting his students in Portland the weekend of September 26-28th. All are welcome to the seminars which will be a combo of Brazilian Jiu Jitsu and stand up self defense (bring both gi and no gi uniforms). For further questions check out Ecole de Budo's website. One word.... HELLSYEAH!!!!!!!!!!! Paul Daley, Andre Dida, AND Buakaw!?!?!?! WAR Buakaw!!!! Someone please tell me this will be on PPV!?!?!? More info by clicking here. 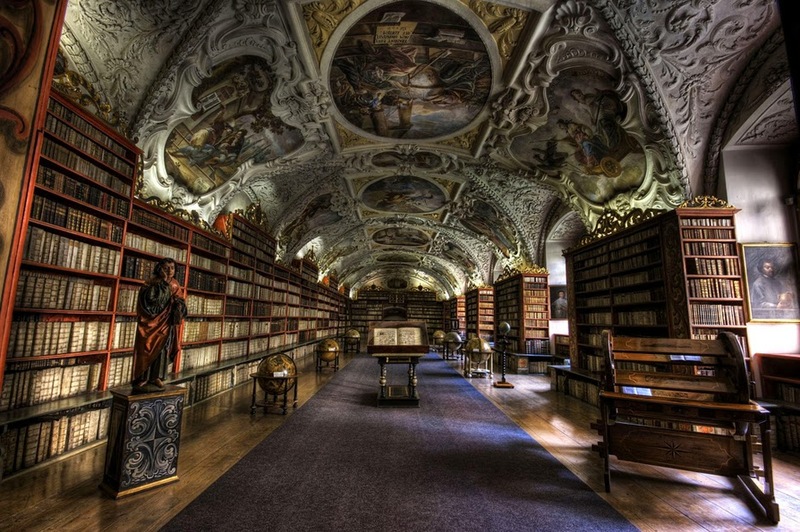 After much hoeing and humming I have decided that I do not absolutely NEED every damn martial art book on the earth, therefore I am parting with a good chunk of my personal library. All these books are in great condition (I do not write in books, nor dog ear) unless otherwise stated, and the asking price is fair but certainly negotiable especially if getting more than one. Keep in mind many of these titles are no longer in print. I am happy to ship so email me ([email protected]) and we can coordinate the S and H and details. First dib's go to my blog readers. I have a number of various Chinese manuals on Praying Mantis Boxing, and Baji Quan. These are in Chinese, email me for more info. 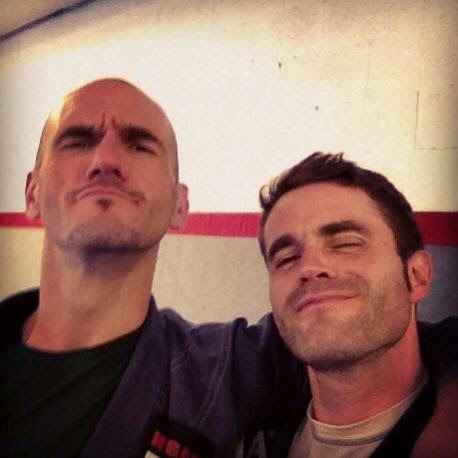 Wanted to send a thanks to my bud Callum Medcraft, editor at large at THE premier grappling magazine Jiu Jitsu Style. He posted my promo pic from back in February! Thanks brother! Soul Roll Jiu Jitsu rolled out their new Alpha Gi and rashguard earlier this year, and for the past few months I have been wearing and tearing through this gi. 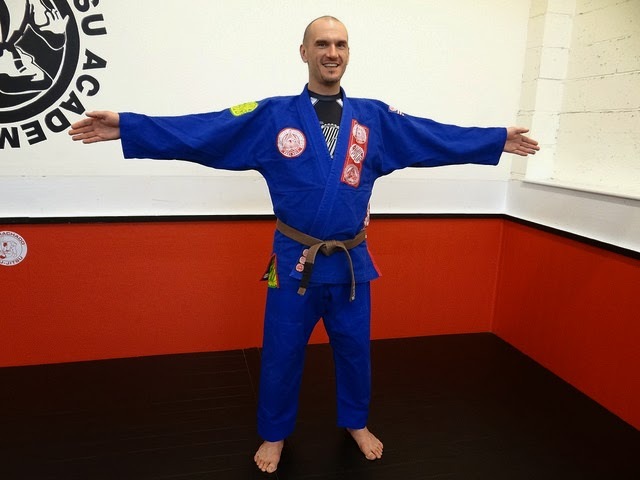 First impression of the blue Alpha gi is just how bright and brilliant the colors and contrasts are on the gi. A blue gi with a myriad of patches encompassing every major color in the spectrum embodies one of the lightest kimono's on the market. I first looked at it and thought, "Man, this looks like a big A4." Before we talk about the wear, lets address the tear, of which there is none to speak of. The Alpha gi has held up very nicely over the past few months with no signs of ripping, fading, pilling, nor loose threads. I wash and dry all my kimono's in machines and often the color fades and the gi shrinks moderately at best. Again no sign of damage and honestly I wish the gi would shrink more as it has barely tightened up after dozens of washes. The Alpha kimono top is a 350 gram pearl weave that is super soft and breathes decently. 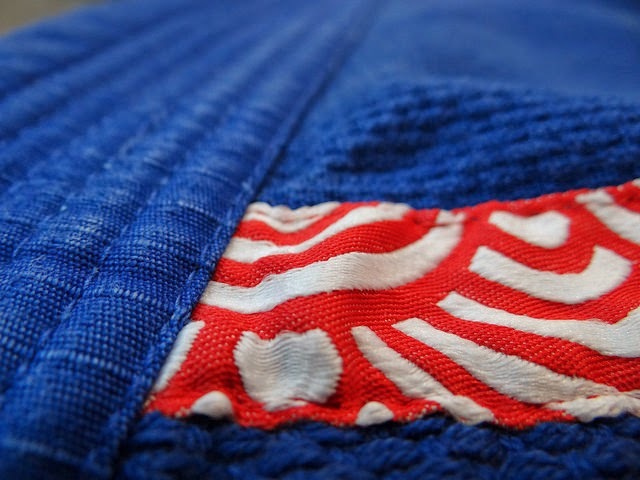 Triple stitching accompanies every seam, and stress points have been reinforced all of which again hearken to the durability I have experienced wearing Soul Roll's gi. The patches and embroidery all are tightly stitched and have not ripped nor pilled. As you can see the patches are everywhere and can be a bit hard to read if you are unfamiliar with the brand. I am typically a fan of patches but even this gi is a bit much. 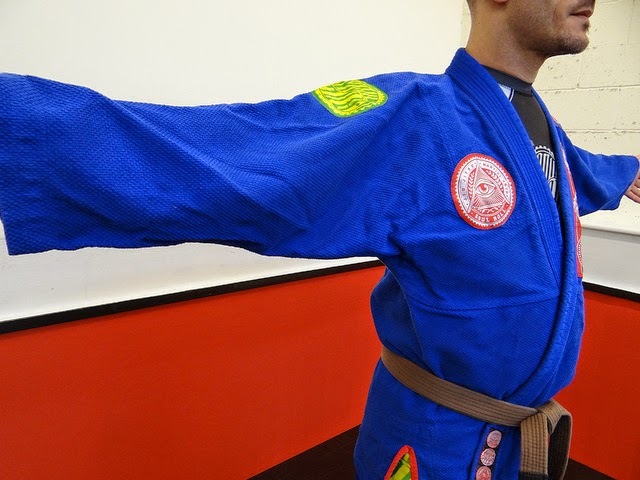 I do believe technically all the patchwork is IBJJF legal, but if you plan on wearing it in competition I would highly suggest taking a backup as I have seen ref's disallow perfectly legal gi's such as the Alpha because they "thought" it was illegal. You have no time nor recourse to argue with the ref (especially if you are not Brazilian) so better safe than sorry. Soul Roll's ripstop pants feature a drawstring with no fewer then six loops as well as double fabric covering the knees. The cuff's are double stitched and have worn well. The ripstop material make this kimono overall pretty light. A tighter fit with less fabric would most likely assist in a few ounces and this kimono really retains water, so be forewarned. In regards to wear this kimono actually misses the entire mark. The A4 I received is extremely baggy throughout making for an uncomfortable fit and bunching at the armpits. When asking $190 dollars that puts Soul Roll into the upper middle echelon in terms of gi prices, and when paying those prices one expects a tighter, more grappling friendly fit. 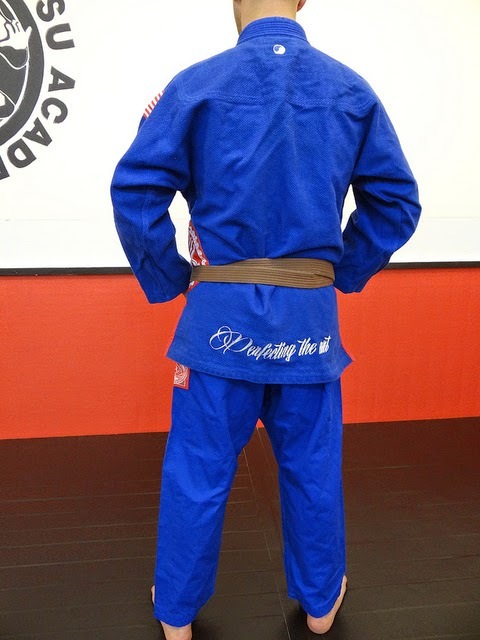 The Alpha Gi can be ordered by clicking here! My experience with the Soul Roll rashie is much the same as the gi. 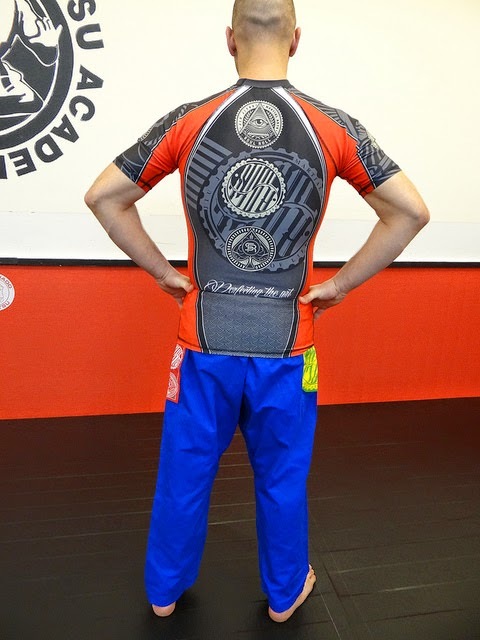 A very durable and strong rashguard that shows no signs of wear nor tear. 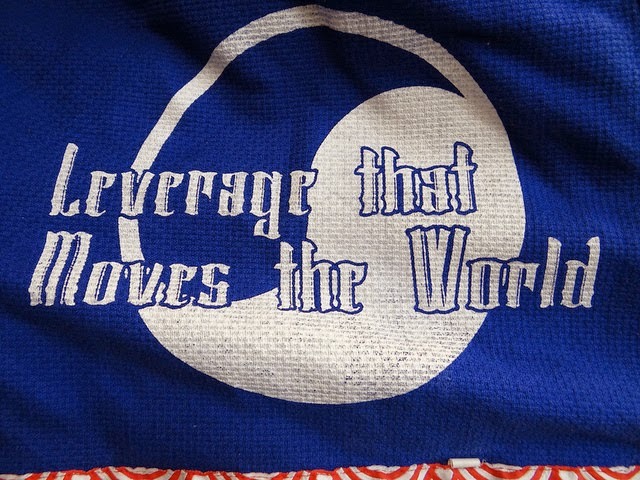 Sublimated graphics ensure no peeling and crap on the dojo's mat. Triple stitched seams embody the rash guard and a tight fit make this damn near unrippable. But the XL rashie is a bit too tight and fits one like a hot dog casing. Though it breathes well the restrictive nature make it rather uncomfortable to wear. I am guessing the design team in Asia did not compensate for the larger North American build. 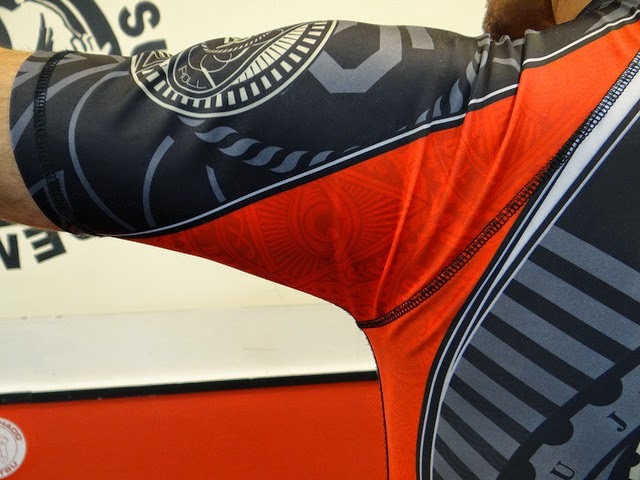 Retailing at $59.99 you can order the Soul Roll Rashguard by clicking here. 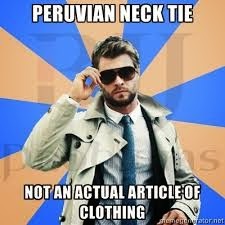 An absolutely sick Peruvian Necktie with the lapel. 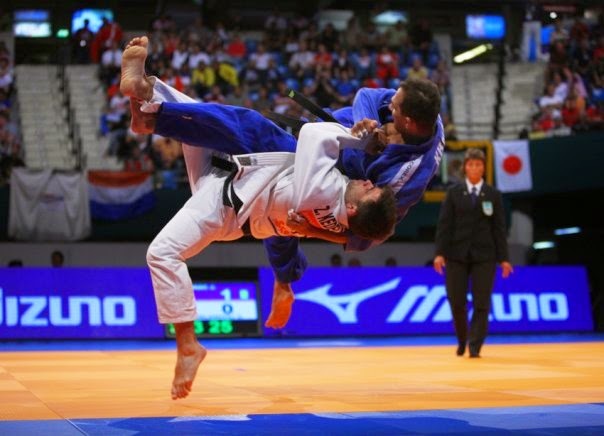 Funny... the Judoka out there are arguing whether this was an illegal choke because she pulled out her lapel. Sadly both Judo and BJJ are regulating themselves into boredom. Post by IJF - International Judo Federation. Our good friend and coach John Machado (David Mamets "Red Belt") continues his film career with "Justice For Hire (JFH): Retribution Task Force." Based on the most downloaded MMA comic book online, JFH is inspired by real events in Port Moresby (supposedly one of the bloodiest cities in the world!?!?) Papua New Guinea. Check out a free download of the comic book by clicking here. It is officially official... mark the calendar, pre-register, and book the tix to DFW. Five brothers, three days, one love! All ranks and affiliations are welcome. Register today! 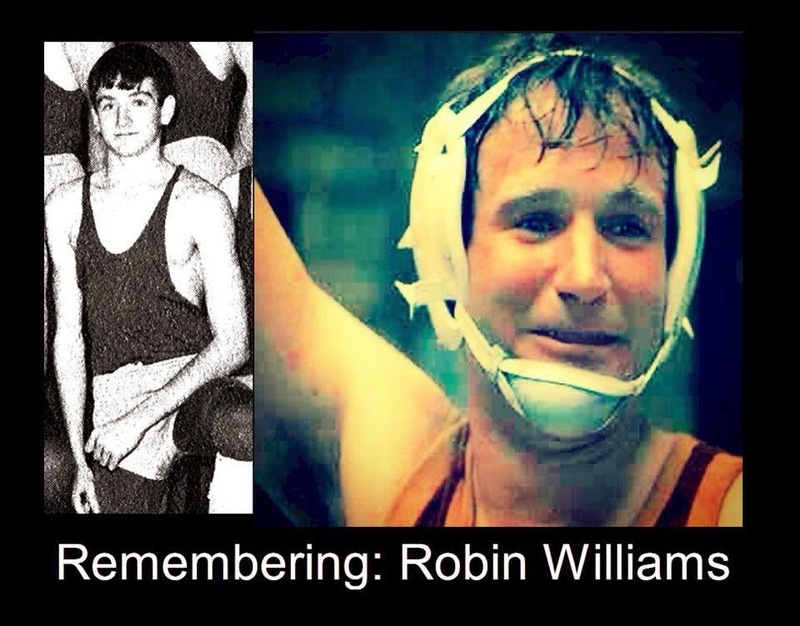 Oh captain my captain. I am glad you are finally at peace. Traditional Dit Da Jow / Tieh Da Jiu, often translated as either "Fall - Hit Liniment" or "Iron Strike Liniment," is a traditional Chinese herbal remedy used to help heal contusions, bruises, sore joints etc. Because of the nature of the liniment it became synonymous with martial art schools and groups, and over time each family developed their own specific recipe for both the herb content as well as the methodology in which it was brewed. In general the herbs help to facilitate blood flow and the movement of lymph through the injury. Some recipes (such as the one I offer) bring lots of heat to the injured area. These elements combined help to speed along recovery and shorten the injury time. My experience with Chinese medicine is limited to the many amazing healers I have met in New Mexico, and the 500 or so hours I took at Natural Therapeutic School that covered general principles and theory. I have studied some Tui Na (Chinese massage) and have been taught many various things from my friends in NM that were DOM's, but I cannot say I can prescribe anything so the following should be read with common sense and the knowledge that I am just some schmuck babbling on a blog that you happened across one lazy Tuesday afternoon. My introduction to jow and its usage came via the Chinese martial arts and my first CMA teacher Dug Corpolongo in the Burque, NM. Dug has an eclectic approach to the arts and it was via him that not only did I learn the basics of CMA, but also I owe a debt of gratitude for influence on me spiritually in regards to my future in Chinese Philosophy and Religion at university. Dug knows a fair amount about herbs and massage and he was kind enough to impart his knowledge and info onto me through the years. His friends Kurt Saenz and Phil Romero also shared their knowledge of traditional Chinese healing methods learned in guan's across Asia. Many martial artists were also healers of one sort or another, so the knowledge of how to hurt and heal is not as cliche as one would sometimes assume! Kurt and Phil learned from their respective masters Augustine Fong and Hawkins Cheung respectively. The list grows for me in New Mexico as I was very tied into the CMA community which was small and many students were also students at the various acupuncture and healing schools (we had up to 6 at one time in a 120 mile radius around Albuquerque!!). So jow recipes and talk got thrown around quite a bit, and quite frankly none of them were bad, but nothing to get excited about. 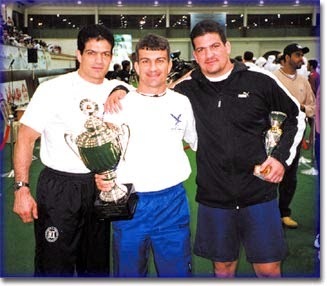 Then I met Mike Biggie via Steve Cottrell one day while competing at Tony Yangs Wu Tan Invitational in Akron, OH. As a gift Mike gave me a bottle of his latest batch of jow and it was amazing! I had some serious bruises from getting hit on my ribs and his jow healed it up within 3 days! Now for those of you whom are unfamiliar with Mike Biggie, well you really have not studied your North American CMA history because he has been here since the early 70's. Known for his devastating Choy Li Fut, Mike's mistress is Northern Mantis. Namely HK Seven Star! 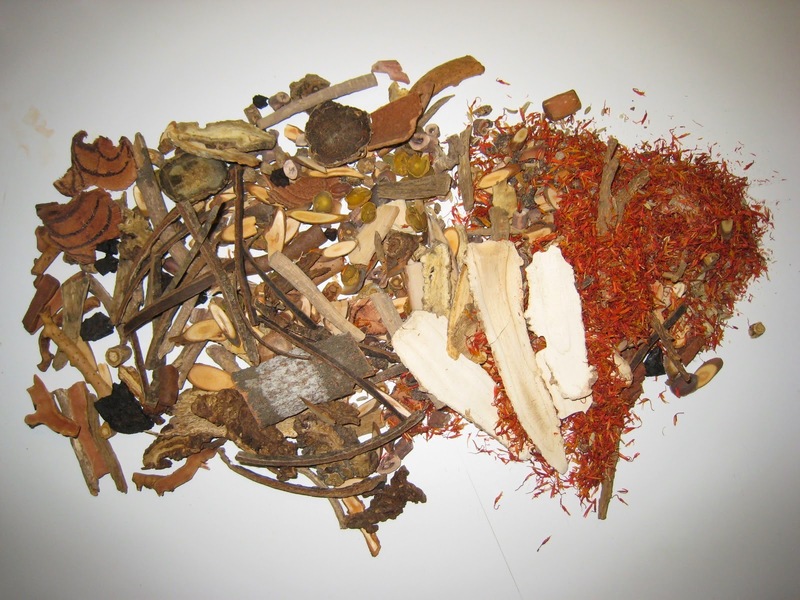 As a "hobby" Mike has studied Chinese herbs, only Chinese herbs, for as long as he has trained CMA. He has no degree. He does not treat people. But he has collected recipes, studied the various qualities of combining herbs, and treating various ailments of his own for over three decades! To say he knows a thing or two is quite the understatement. Luckily Mike and I are basically from the same stock and hit it off quite well. As a matter of fact he is one of the few "old timers" I stay in touch with. And it is through him that I get my herbs for the recipe I have (story for another time about the recipe I have from the mid 1800's). I also learned Iron Palm technique from him, and he has taught me a lot about liniments, jows and herbs as well. This liniment is perfect for anyone who does any kind of contact sport! I have had friends use it on their kids bruises from soccer and football. My mother used it for arthritis. I use it in recovery from serious injuries. 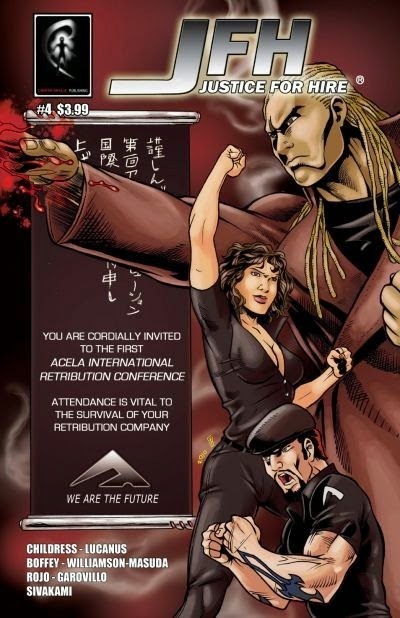 So fresh off the press that we don't even have a poster for it, but the official announcement has been made with the annual 5 Brothers Camp being held at the Colony in the DFW (Dallas) area on October 24-26th 2014. 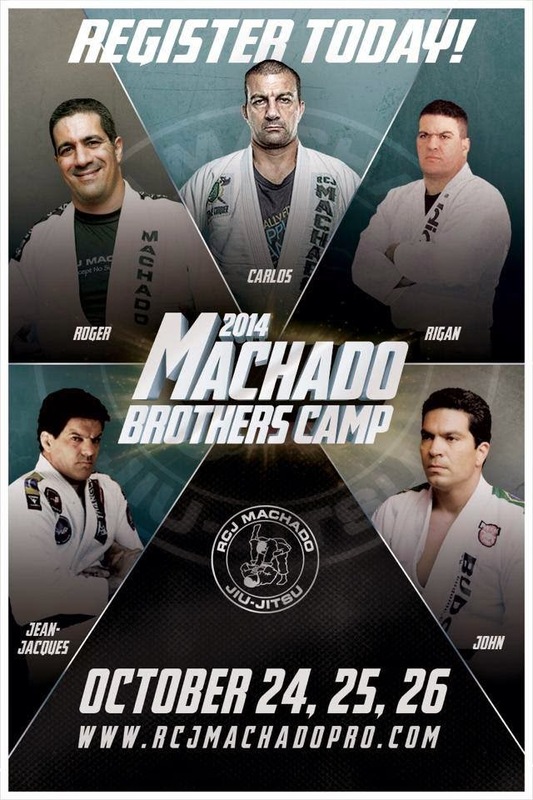 Join all five (Carlos / Roger / Rigan / Jean Jacques / John) of the Machado brothers as they impart over 200 collective years of experience and wisdom gained on the mats. This even is open to any and all ranks, affiliations, and experience levels. 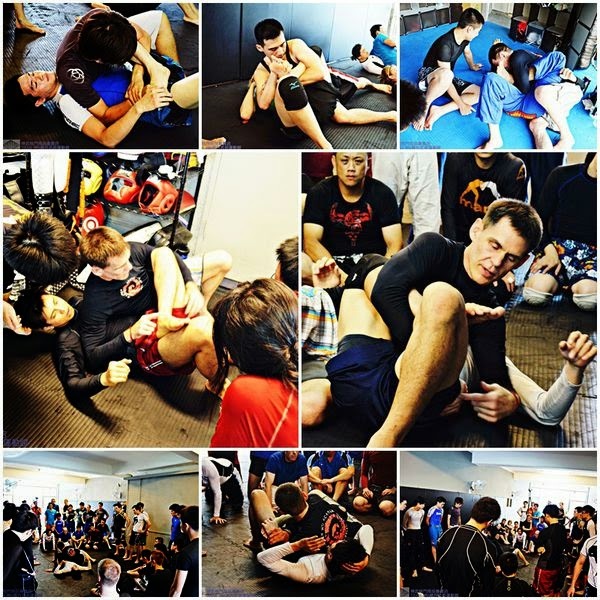 This is true Brazilian Jiu Jitsu, NOT a sport jiu jitsu camp! 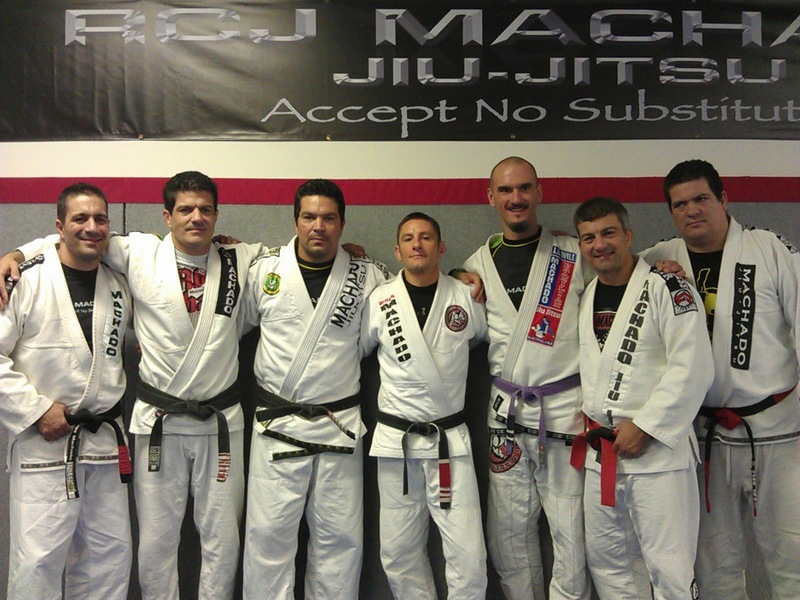 Where else can you get hands on training from THREE red-black belts??? Great teaching. Great people. This is exactly what our art is all about! We will have more info at RCJ Machado in the coming days. Special guest appearances this year as well! There will be no class tomorrow morning. I apologize for any inconvenience, but we are back to normal scheduled classes on Tuesday. Enjoy your weekend. Goeido was promoted to the rank of Ozeki following one of his most dominant performances at the Nagoya basho (12-3)! Goeido was one of the most promising wrestlers just a few years ago, but ran into consistent performance issues and fell to the rank of Juryo. This is promising news as he has given the Yokozuna a run for their money as of late. Congrats to the new Ozeki and we look forward to the next basho. Why did you choose the phrase "Yamato-damashi" (Japanese spirit) in your acceptance statement? "I chose these words because they reflect the strong endurance and graciousness of the Japanese people, and they convey my feelings in a simple manner." 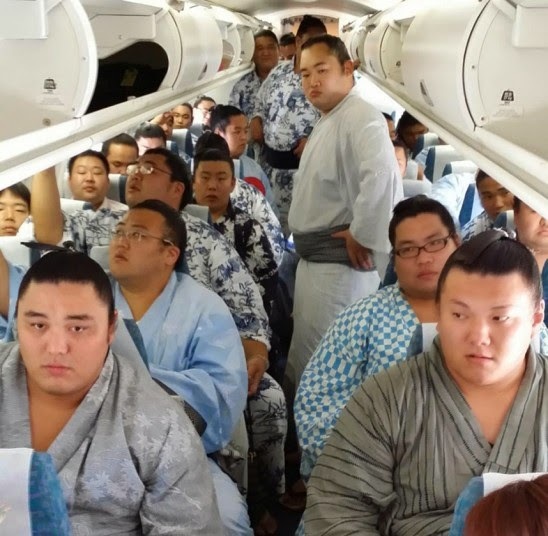 On average your typical Sumo wrestler weighs about 150 kilos, meaning 29 of them brings us in at around 4.3 tons!! These wrestlers from the Hakkaku stable had a good sense of humor about it at least. Click here to see the entire article. 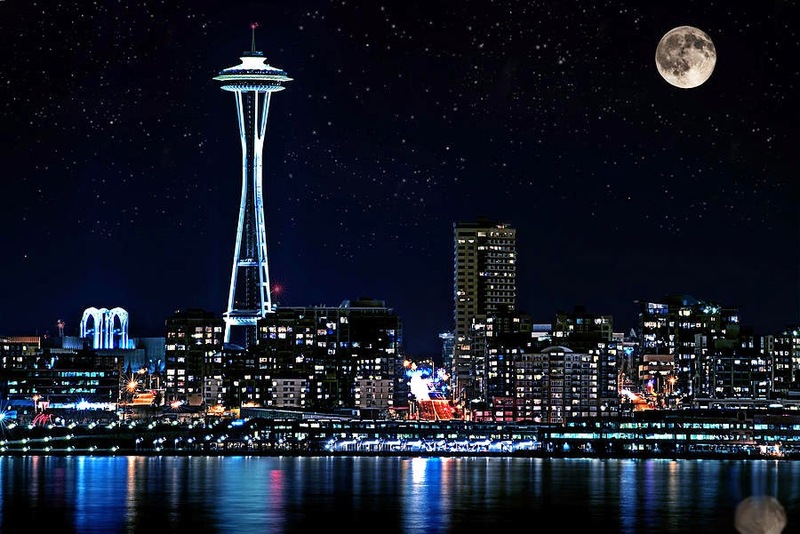 The IBJJF just announced that Seattle (technically Everett) will be the next city it invades! October 25th is the date for the IBJJF's first visit to the Evergreen state, and though I do not know why it is considered "international" fighters should expect players from throughout the Pacific NW and western Canada since this neck of the woods has been untouched by IBJJF thus far. If you are still supporting this organization, mark the date, read up on the recent rule changes, and work on your guard game. A quick note to remind students that tomorrows (August 2nd) class will be at 9am instead of the normal 10am. Also next Saturday, August 9th, there will be no class. 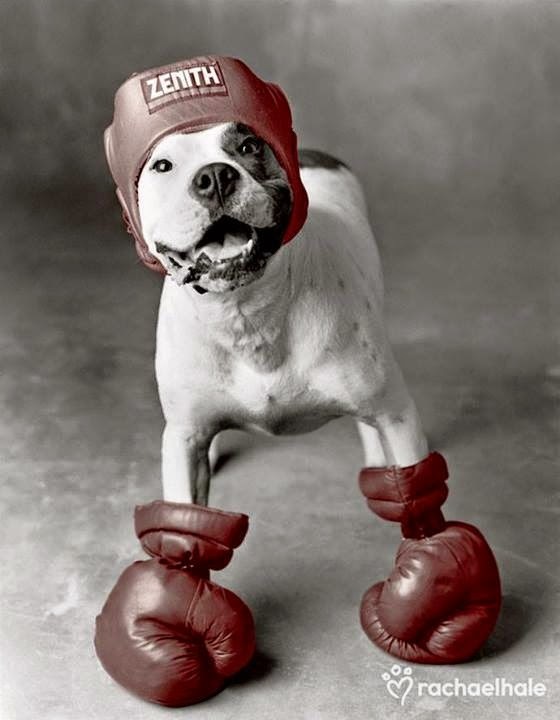 See you on the mat tomorrow at 9am!